Compass Invoicing is Greycoat’s advanced solution for construction materials and aggregate operations which integrates job quoting, tax and fee calculations, customer invoicing, and trucking statement generation, into one powerful tool. Utilising Greycoat’s robust messaging software, Pipe, Compass Invoicing features real-time updates of scale-house tickets with strong data redundancy and security features to ensure authenticity and accuracy throughout operations. Based on Microsoft’s .NET infrastructure, Compass Invoicing is optimised to work with Microsoft‘s line of professional products (e.g. Excel and PowerPivot) while offering a familiar and easy to navigate experience. 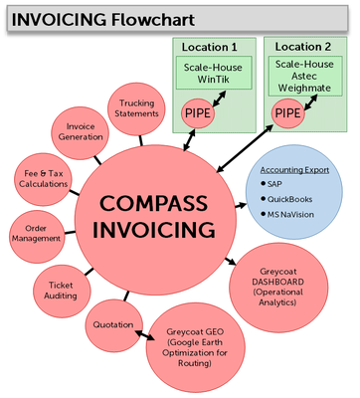 Compass Invoicing can fuse with Greycoat’s dynamic Dashboard software for seamless data analysis, and our GEO software for leading map based (Google Earth) trucking route optimization. Invoicing also integrates with industry standard software such as SAP, QuickBooks, and Navision for straight-forward accounting. Familiar user experience across all modules minimises user errors & maximizes effectiveness. 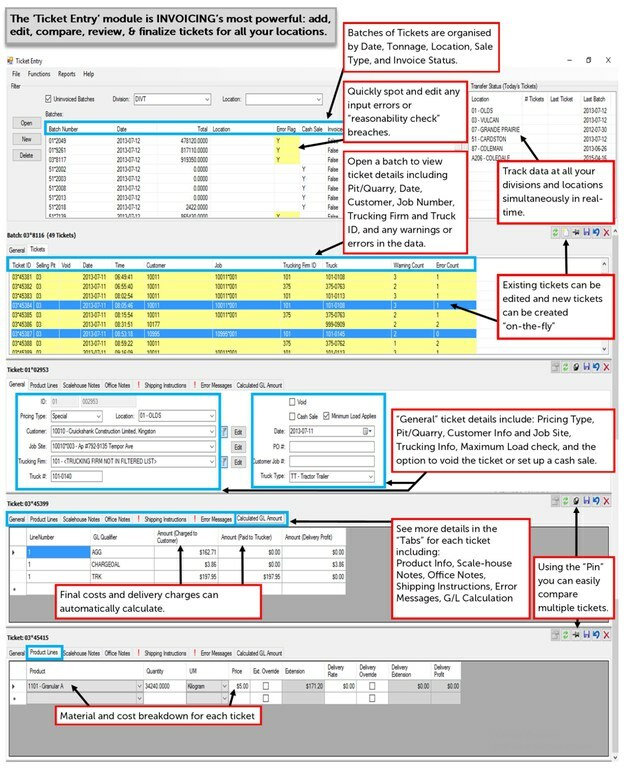 Manage all your pits/quarries/ plants, quotes, products, prices, delivery locations, and customer records from one program. Get ticket (bill of lading) information in real-time directly from any scale in operation. Quickly view your final costs and trucker statements. Calculate for Ton-Miles Hauled, material handled, and base rate. Calculate rates across multiple tax jurisdictions and “effective dates”, by customer & location. A clear breakdown of surcharges for regulatory regimes. Handles customer exemptions. Security settings on a “per user” basis allows for clear data ownership and audit creation. Easily compare invoices, customer data, and job site information. Integrates with Compass Dashboard integration for seamless real-time data analysis and productivity. Flexible invoice formats depending on company division. Make small edits to whole batches of tickets to ensure accuracy and save time.